No, this isn't an ad for some illegal download site, this is an actual legitimate company - offering exactly that. How much would you actually pay "to screen a theatrically-released film in their home"? How about around $500 a movie. That's the estimated price per picture for Prima Cinema, a new California-based company that has finally installed its first home entertainment system to distribute what they claim are theatrical run movies at home. It came up as a $20,000 (per year) listing on Uncrate, but the actual official website seems to carefully skirt around specific details regarding first-run films. Is this really going to work? 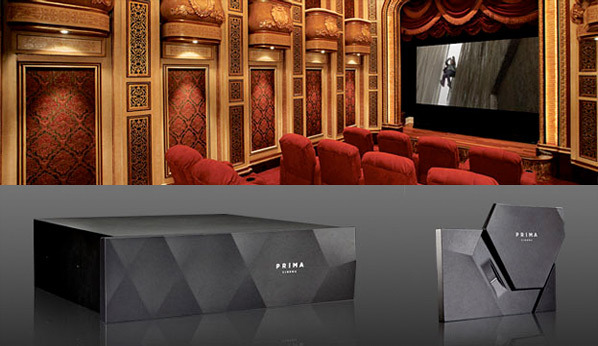 According to the website for Prima Cinema, which was first announced in press releases in 2010 (see THR), the service is based out of a rack-mountable box that they claim can provide: "PRIMA Cinema presents theatrically-released Hollywood films, in the comfort of your home… Until PRIMA Cinema, only a select few entertainment insiders were able to screen a theatrically-released film in their home. No longer." Well how about that! The site explains a "PRIMA Cinema Player and the PRIMA Biometric Reader [a fingerprint scanner?]. Films are automatically delivered to the PRIMA Cinema Player over broadband." So it's just downloadable new release movies in a proprietary, expensive set-top box. Let's dig a little deeper into this. If you take a closer look at the investors on their site, it lists a few key names: "backed by Best Buy Capital, the investment arm of Fortune 500 global retailer Best Buy Co., Inc., Universal Pictures, a major motion picture/television studio and distributor, as well as Syncom Venture Partners, a venture capital firm specializing in media and communications." This might just be the same Universal that experimented with that $60 home release of Tower Heist, that never actually happened because movie theaters started to balk. Prima's Board of Advisors also contains some very notable Hollywood figures: ex-MPAA head Sid Ganis, director Peter Farrelly, Fox's Ira Rubenstein, and NetJet's Lauren Fryefield, among others. I hate to say it, but this entire service kind of sounds like the paid non-pirated version of theatrical movies for rich people. If you can afford the outrageous "one-time fee of about $20,000 for a digital-delivery system and an additional $500 per film" (via Wall Street Journal 2010), you can get these movies in your home. Though the website doesn't list specifics, it sounds like it may only be Universal and/or Fox movies, considering they've got imagery from Bourne Legacy in every photo. But nonetheless, they're trying to get back into the game of non-pirated theatrical release movies at home, but with a select demographic it seems. If you're interested in checking this out, visit primacinema.com. That website lacks quite a bit of actual info on the service, and even the FAQ is considerably vague, besides promising that "PRIMA Cinema… will support 3D films." Hooray…? I wish they had a more specific pricing info, details on when exactly movies will be available (upon release or a few weeks later?) and which studio's films are "supported", if limited. Still, an interesting new development in the release game that seems to be quietly sneaking out - the first install was in June, quoting a $35,000 price. Will expensive home offerings change Hollywood? Thoughts? I don't get why they dont just make it something reasonable.. I would pay 20 bucks a movie to watch at home. When Indies dont make it to the theatre at my house I either am too lazy to go drive and see it, or i use graboid and watch a bootleg. meant theatre by my house.. and most of the time I just wait until VOD. Unable to comment. Still bewildered by the price. Nothing beats going to theater and watching a movie on opening day. Of course the fee is astronomical right now.....but I truly believe that in a few years we will be able to screen theatrical release films at home for a fair price. The way we watch television and films on our mobile devices has taken a huge leap in just 5 years. The market for ON DEMAND entertainment is huge and it's only getting bigger and more advanced. I think it will take a big name title to really gage the reaction of consumers but I'd be happy to pay say £20-£30 (around $50) to view the latest film in the comfort of my own home (it would cost me that much to take my wife to the local flea pit theatre any way!). As someone said in a previous comment it would be like buying a pay per view event and inviting some friends around to make a night of it...which as a concept really works. but why should consumers have to pay MORE to watch it in their own home? it shouldn't be any more than the price of a ticket at the theatre. right now, PPV usually runs around 4-7 dollars (depending on area). Well I guess the argument would be that I could in effect show the film to dozens of people in my own home (if I had the room!) so a more substantial fee would be fair in my eyes. It would work for big tent pole movies such as The Hobbit or Skyfall....at the end of the day it's all about giving the consumer more options. Perhaps after the first two weeks of release the price could come down by 50%. I realize that this would have an impact of theaters, but my argument would be that I very rarely see a screening more than half full these days. I took my wife to see the final twilight film on opening day and there were about 20 people in there! Surely it makes sense to reach the largest possible audience? And for me the answer is to release movies on every format possible (on rental basis). I'll admit it's a bold step but i think it's going to happen sooner rather than later. well - i'm far from an expert in this sort of thing from a legal perspective; but, it seems like there would be laws keeping people from doing that. of course, you could do it and hope you're not caught. i don't think i'd want that many different people in my home. i really think it's just a matter of time till the films are distributed via satellite (or however) that is more cost effective. i'd be very excited about being able to watch first-run films at home. thanks for the interesting reply. Well when I was in Vegas staying at New York New York back in 2005 I remember being able to purchase a first run film, (which was still in the theatre) in my hotel room for 10.00 or so. This is not new, and is possible at a reasonable price that all could afford if sold on a massive level, hence why Best Buy may be an investor in this. Also Dish Network has had some movies (maybe 3 or so that I can remember that were in the theatre but I was able to buy the VOD and watch it at home, the one I did watch at home was Red State, I think it was 15.00 to watch at home. The biggest reason this may be hard to do wide spread is that the Theatre owners will give major push back.